Last week fundraisers from across Queensland gathered on the Australian Gold Coast for the Fundraising Institute Australia Dare to be Different conference. 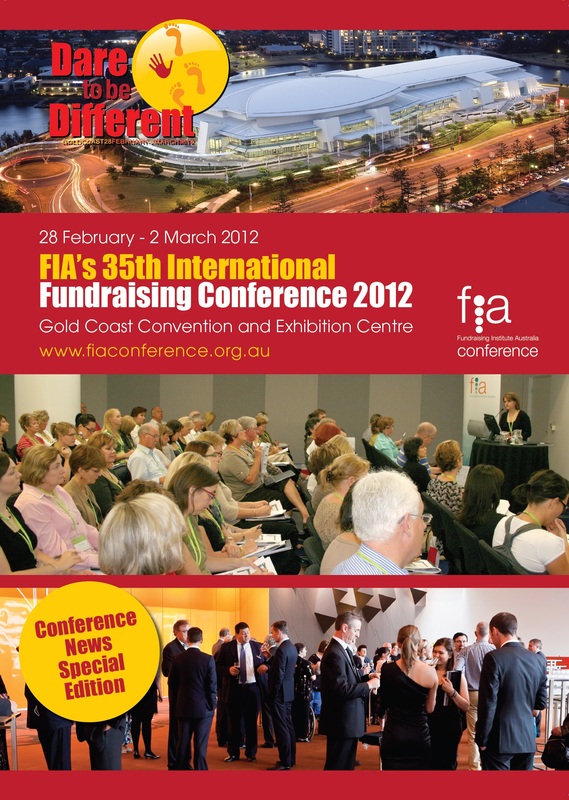 Many people asked me what I thought the differences were between fundraising in the UK and Australia. I struggled to come up with many apart from the difference in population size (Australia approx 22 million and UK approx 61 million). My observations are that there are more similarities than differences…. People give to people. Fundraising is about building relationships and connecting donors to the cause and showing them the difference they can make in the world. As Kay Sprinkel Grace observed in the opening plenary, fundraisers across the world are brokers of dreams. A tough economic environment poses challenges for fundraisers the world over. Fundraisers must find a balance between focusing on activities that will bring in the highest rewards as well as identifying future trends and developing creative solutions as Tony Elischer demonstrated in his sessions. Recruiting new donors is hard and recruiting the right donors is harder. Adrian Sargeant stressed that ‘it’s better to spend more bringing in people who are right then have better response rates from people who will never give again’, and helped us understand how to identify and attract the right donors. Keeping new donors is even harder. In the UK 50% of new donors are lost in the first year. Then 30% are lost year on year. In the USA 75% never come back. Organisations must build trust and loyalty and develop long-term donor relationships. As a sector we are very open to sharing and learning from each other. Christiana Stergiou and I took the audience through as many fundraising examples from www.sofii.org as we could in an hour and encouraged fundraisers to use this excellent free resource as well as helping others by submitting their own exhibits. At Dare to be Different it was refreshing to learn from what had not gone so well with an open and impressive session from Marcus Blease from Cerebral Palsy Alliance, Trudi Mitchell from Cancer Council NSW and Paul Tavatgis from Cornucopia Fundraising. As a sector we could learn so very much more if we were more open about what did not go so well. Storytelling is the new buzzword. Human beings are hardwired to learn through storytelling . Anthropologists contend that 70% of our learning is through narrative. So it’s no surprise that it’s a skill that fundraisers want to perfect. We love jargon. The usual suspects kept cropping up and the top three terms were supporter journey, touchpoints and integrated campaigns as well as some new acronyms that I have never heard before. The general public has a perception of how charities should operate. Many make decision to donate to a cause based on the % of their donation that will go to services and do not like to think that their donation is ‘wasted’ on administration or staff costs. Dan Pallotta made a case for transparency and the importance of investing in order to effectively fundraise and the importance of communicating the real cost of raising funds to donors, supporters and the public. Fundraising is not always perceived well outside of the sector. Asking for bequests was picked up by the tabloid press, quick to paint a negative picture of the sensitive topic of how fundraisers ask people to consider leaving a gift in their will, which could make a lasting difference to the world. The world is small. I met several of ex-colleagues from the UK and from the NSPCC as well as Twitter friends. I liked how the world got smaller. So that’s the top line. But for me the most important thing I came away with was inspiration from meeting a collective of passionate people doing great work for a range of causes with a restless energy to do more. I’m proud to have the opportunity to work with you. And not forgetting, that in addition to your great work, you all know how to party. This entry was posted in creativity, failure, focus, fundraising, Innovation, insight, Inspiration, leadership, Life and Death, relationships, remarkable, SOFII - Showcase of Fundraising Innovation and Inspiration, story and tagged Adrian Sargeant, Australia, bequest, Cancer Council, Cerebral Palsy Alliance, charity, community, connectedness, Cornucopia, customer service, Dan Pallotta, dare to be different, FIA, fundraising, Gold Coast, jargon, Kay Sprinkel Grace, scribbly bark, stories, Tony Elischer. Bookmark the permalink. Fundraising and charity are international. Good ideas travel well. Charity, and the idea of doing something else for another person for nothing is, I feel, one sign of a civilised society. It would be interesting to know if the idea of ‘charity’ is practiced in other parts of the world. Thanks for posting the conference wrap-up, Lucy. It sounded like a great gathering. I particularly liked the idea of a session with people honestly discussing what didn’t go quite so well – we can all learn from those, and a session like that makes for a change (in more ways than one! ).